The existing guidance has been in effect since 1993, and while it has held up well over that time, “stakeholders expressed concerns about the complexity, insufficient transparency, and limited usefulness of certain aspects of the model,” said FASB Chairman Russell Golden. “The new guidance simplifies and improves the face of the financial statements and enhances the disclosures in the notes,” he added. The update will change the way all not-for-profits (NFPs) classify net assets and prepare their financial statements. All nonprofits, from the local soup kitchen, to major colleges and universities, have been using the same financial statements for the last 20 years. While good, at the behest of stakeholders, the FASB saw the need to make improvements to the existing model. The new guidance applies to all NFPs, including: 501c3, 501c4 and 501c6 entities. 501c3 – This is the most common classification of nonprofits. To qualify as a 501c3, an organization must fit into an “exempt” purpose as defined by the IRS. These include charitable, religious, educational, scientific, literary, testing for public safety, fostering national or international amateur sports competitions and preventing cruelty to children or animals. 501c4 – There are only two types of organizations that will qualify as a 501c4 organization: social welfare organizations and local associations of employees. Social welfare organizations can include homeowner associations and volunteer fire companies if they fit the exemptions. 501c6 – The 501c6 designation is for qualifying business leagues, chambers of commerce, real estate boards, boards of trade and any professional football leagues, that are not organized for a profit. There are actually 29 different types of NFPs identified by the tax codes, but these are the three most common entities. 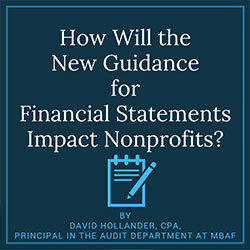 Regardless of the classification, all nonprofits will be required to follow the new financial statement requirements. The FASB has produced a video, explaining why the standard needed to receive a makeover. The FASB believes that the update, not only simplifies and improves communications with stakeholders, it should also reduce certain costs, related to the complexities in preparing their financial statements. Will allow “underwater endowments,” those that are now worth less than when they were originally gifted, to be classified in net assets with donor restrictions. Continues to allow preparers to choose between the direct method and indirect method for presenting operating cash flows. However, if the direct method is used, it is no longer mandatory to present the indirect method reconciliation. Requires NFPs to be more transparent regarding providing information on how it manages its liquid resources and liquidity risks. A classified statement of financial position may be an effective way for organizations to comply with many of the new disclosure requirements. Requires that a net presentation of investment expenses against investment return appear on the face of the statement of activities. When Do the Changes Take Effect? The changes will take effect for annual financial statements issued for fiscal years beginning after Dec. 15, 2017, and for interim periods within fiscal years beginning after Dec. 15, 2018. This is just “Phase 1,” of the FASBs project to revamp financial statements for nonprofits. The organization says there will be a “Phase 2.” Phase 2 is slated to address ways to improve operating measures and provide enhanced alignment between the statement of activities and statement of cash flows. The FASB has not indicated any timeframe for the completion of the second phase. Certainly, these new regulations will have a significant impact on all nonprofit organizations and those stakeholders who rely on their financial statements. While the changes were designed to simplify financial reporting for NFPs – and in the long run, they will – getting used to the new requirements could still be complex. The earlier you begin working with your tax professional, the easier it will be to implement the necessary changes to ensure your financial statements will be in compliance with the new standards when they take effect. David Hollander, CPA, is a principal in the Audit Department at MBAF. David has broad experience in various industries including aviation, distribution, manufacturing and nonprofit organizations. David has been in practice since 1994 specializing in audits of small and medium size businesses and non-profit organizations both domestically and abroad. David’s dedication to his clients has resulted in a stellar reputation for service and he is known for his personalized service and timely prevention of potential problems. He has extensive background with foundations and organizations that receive federal and state funding. David also deals with many of the firm’s employee benefit plan audits. David works closely with our Technology Consulting Department and continues to provide feedback in regard to our computer development and the internal control environment.